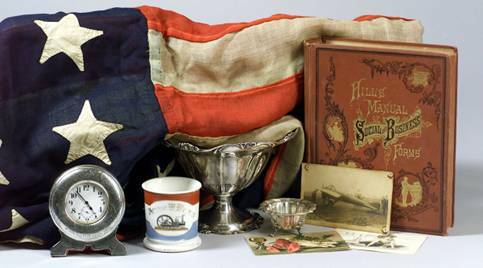 Murphy Insurance is pleased to join Skinner Inc. as co-presenting sponsor of The Wayside Inn Antiques Show. In the lead up to the show May 11-13, we’re please to have had Karen Keane provide our readers with insights on the process of consigning property for auction. This blog post completes my series on Consigning at Auction. We’ve covered the appraisal process, what to expect in an antiques appraisal, and auction schedules. Now, we’ll discuss auction fees, as this is often an area where many people have questions. Auction buyer fees and seller fees are the industry standard. The fees pay for the work the auction house puts in to make sure your property reaches the best possible buying audience. The buyer’s fee, or buyer’s premium as it is called, is a percentage that is added onto the hammer price of an object. (The hammer price is the final value called out at the auction.) The buyer’s premium is always paid by the buyer, and it is never waived or reduced because doing so would be considered giving unfair advantage to one buyer over another. Buyer’s premiums will differ house to house and generally range anywhere from 10%-25%. See Skinner’s Conditions of Sale for our buyer’s premium. The seller’s fee is called a commission, and this can differ seller to seller, anywhere from 0% to 25% of the hammer price of an object. Why such a broad range in fees? Unlike buyers, sellers are not competing against each other, and simply put, great stuff drives the auction business. Bidders want to buy great objects, so auction houses want to sell great objects. And as a seller, if you possess the rare and beautiful, you’re in the driver’s seat. You can negotiate a lower commission than a seller with average goods, and even no commission at all if your item is exceedingly rare. If you are selling an entire collection, this can also warrant a lower commission. A seller’s commission rate is confidential between an auction house and the consignor. Again, all of this is standard practice within the industry. Other seller’s fees might include nominal charges for photography of your item, insurance, transportation, or for special services such as restoration, cleaning, or repair of an object prior to sale. Your chosen auction house can walk you through their standard consignment fees and work with you on an appropriate rate for your property. When negotiating fees, remember that you get what you pay for. This is critically important in a service-oriented business where specific expertise is required, such as fine art & antiques auctions. Be wary of an auction house that promises to sell your objects for no fees at all. This could indicate a lower level of service, or be a tip-off that items of a similar caliber to yours don’t find their way to that house often. If they don’t often sell the material, they won’t know who the key buyers are and how to reach them, creating a potentially adverse effect on the hammer price at auction. The auction process is thousands of years old. It’s a tried and true method to find the highest price for an object by creating competition in an open market space. You the consignor and the auction house are on the same side, both working toward ensuring that a valuable object realizes its potential. Now, what could be smarter than that?